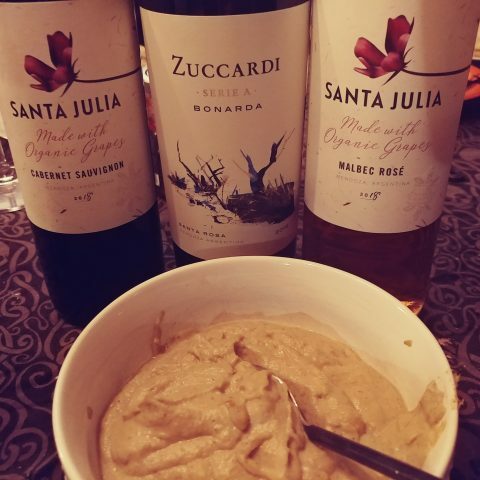 This month, I was specifically looking at wines that will pair well with holiday party foods, so I only sampled dry wines. Two of the wines I tried were made in the traditional or classico method. The other wine was produced using the charmat method. We did our first couple of pairings for Sunday supper. It was also the day we’d brought home our Christmas tree, so we started enjoying the Ferrari while we decorated the tree. 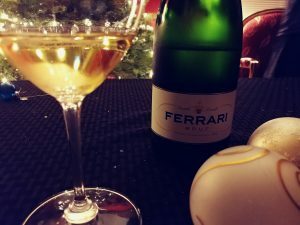 Ferrari is a historic Italian sparkling wine house. They started production in 1902 and from the beginning the house wanted to make a wine that would be of the quality to compete with Champagne. The wine was very good. It’s 100% Chardonnay produced in the Metodo Classico. This is the first style of wine the house produced and they know what they’re doing. The wine is a lovely clear lemon yellow with fine and persistent bubbles. The nose is medium+ intensity with distinct notes of ripe green apple, lemon curd, a hint of yeast, fresh white flowers and a bit of vanilla and toast. The palate delivers the apple, lemon, yeast and bready characteristics. The wine has a nice refreshing finish that lasts for a bit. It was a lovely wine to sip while we worked on the tree and made the evening feel very festive! While Dan and Avery finished up the tree, I ducked into the kitchen to make a quick shrimp pasta as an appetizer. 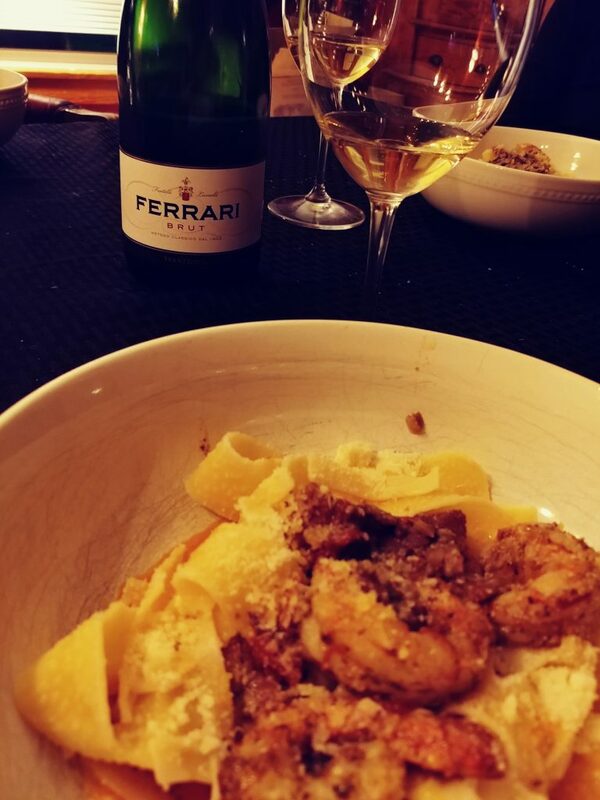 The wine went very well with a simple dish that’s similar to a shrimp carbonara, although a bit lighter than the traditional dish. The smoky bacon and the fruity flavor of the olive oil really picked up on the fruit and barrel notes from the wine. After our main meal on Sunday nights, we often like to do a cheese course. Sparkling wine and cheese can often be a really good pairing. During the holidays, our local cheese monger tends to stock lots of rich, washed rind cheeses, which can be a challenge to pair with wine. We decided to give a light, fresh Italian sparkler from Gavi a try. This wine is produced with the charmat method, which uses no oak, so wines done in this style will have the bubbles, but be lighter in body and seem higher in acidity than wines done in the classic method. The La Mesma DOCG Gavi Le Bolle delivered on both of those things. It has very low alcohol, predominantly citrus and mineral flavors and a gentle fizz that went very well with the cheese course. In the glass, the wine is a clear pale lemon with gentle, small bubbles. The nose is medium intensity peach, pear, lime and lychee notes. The palate is also medium intensity and shows a bit more citrus, both lemon and lime, white flowers and apple. It would make a very refreshing aperitif wine or a great choice to serve with a light meal or a cheese and meat plate. All three cheese pairings worked, but two did work better than others. The Red Rock blue veined cheddar (top in the picture above) was excellent. The natural rind had a bit of earthiness that enhanced the fruity notes in the wine. The salty cheddar and the mild sharpness of the blue veining brought out a slight bit of sweetness in the wine that was really pleasant. The other excellent pairing was the Préféré de nos Montagnes (bottom on the plate) from the Jura region of France. This is a Reblochon-style cheese, although made from pasteurized milk to comply with US import law. It will remind you a bit of a brie, although a bit richer from the Jura-mountain pastured milk. It’s soft, creamy and mild with a wonderful fresh grassy, creamy and nutty flavor. The pairing enhanced the flavors of both. 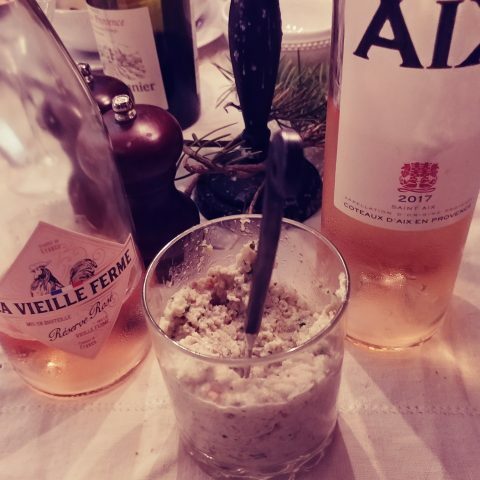 The acid in the wine brought out the hazelnut notes in the cheese and the grassy flavors in the cheese brought out the lychee and grassy notes in the wine. The most challenging pairing was the Munster cheese (right side of the plate). Muenster is a rather strong washed-rind cheese from the Alsace region. It’s a lovely cheese but the combination of the saline and the meaty, nutty and earthy notes that come from the long washing in brine make this a cheese that’s hard to pair with dry wines. It’s lovely with a glass of Riesling or Gewürztraminer. With both the La Mesma and the Ferrari, the wines were just a bit too dry and the cheese made the acid that’s common with sparklers very prickly. 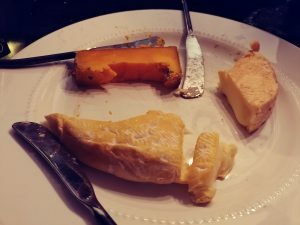 I thought it could work because the paste of a ripe Munster is very soft and creamy, but although the wines did round out the creamyness, neither the flavors of the cheese nor the wine benefited. We had initially bought another dry wine to do with dinner, but since we had a steak for the main and felt like having a nice Italian red with dinner, we saved the other metodo classico for the next night’s appetizer. Since it was Monday, I picked up some pre-made lobster cakes from the supermarket to enjoy with the wine. This was another fantastic pairing. 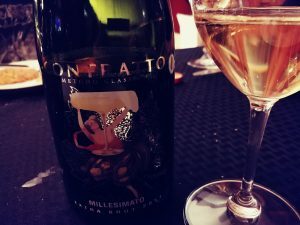 Their entry-level Extra Brut is the Millesimato, which indicates that it’s a vintage sparkler. The one we had was from 2011. The wine is a blend of 80% Pinot Nero (Pinot Noir) and 20% Chardonnay. The wine’s disgorgement date is printed on the foil cap. Our bottle was disgorged in 2017, so it was on the lees for quite some time in the bottle. It also had very, very little dosage, so it was bone dry. The extra time sur lie gave it a lovely pale gold color and an intense nose of creme bruleé, apple, candied pear, honey, brioche, a hint of lemon and lime still lingered in the background with some ginger and ginger flower in the mix, too. The palate showed hints of baked apple and pear, lemon curd, brioche, vanilla, warm spice and a little bit of white flowers. The acid was still present and the bubbles were still fine and rapid. Very complex wine that showed very nicely with the richness of the lobster cakes and the warm spice of the remoulade sauce I served with them. I wound up sipping this wine for quite a while while dinner cooked. After the meal, we went back and revisited it. We still had some of the Ferrari left over from the night before, so we decided to pull that out and give the two metodo classico wines a side-by-side tasting. The first thing to note is that with a proper closure, sparkling wine can hold up to storage for short periods of time. The Ferrari was still very effervescent. It had opened up quite a bit and was showing an intense amount of ruby-red grapefruit on both the nose and the palate. The zingy brightness of the Ferrari highlighted the more woody, aged notes of the Contratto. Both were fantastic wines and are going to be in regular rotation for the holidays. Saute bacon or pancetta in a saucepan until it starts to render. Add onion to the pot, stir and let the onion brown a bit. Add the garlic and let soften. Once the onion is brown, add the tomato, seasoning, olive oil and wine to the pan and let simmer until the tomatoes start to break down. Start the water for the pasta. Once it’s boiling, add the shrimp to the sauce with about a tablespoon of the cheese. Cook over low heat until the shrimp are cooked through, about 5 minutes (more if you prefer your seafood well done). The sauce will be quite thin. Once cooked, drain the pasta, but add a little bit of the starchy water to the sauce before you dump it out. Put the pasta back in the warm pan you cooked it in, ladle in a bit of the sauce and toss to coat. Plate each serving of pasta separately, top with sauce and the shrimp. If you have fresh basil, garnish with a basil leaf and a sprinkling of cheese. Serve with crusty bread for dipping. Looks like you had a great time playing around with some options. Glad to have you join our group. The holidays are always a great time to celebrate with some bubbly. I like the looks of that shrimp and bacon pasta, sounds like it would be great with a sparkling wine! One of the best things about Italian food is that you can make something that’s so flavorful and satisfying with 2 pots and a handful of ingredients. Ah that Munster! I’m a fan of stinky and washed-rind cheese and had similar challenges pairing it. You mention riesling and gewütz- was just in Strasbourg eating Munster so it’s fresh on the brain. If you find an Italian Sparkler you like with it please let me know! I love stinky cheeses, but sometimes they’re… a challenge! We did it again on Sunday night with a sweet Riesling and that worked beautifully. I should give it a shot with a sparkling Moscato. That pasta dish looks delicious and sounds like it’s easy to make. What could be better with a bottle of bubbly at the holidays? Love that Ferrari Trento bottle of bubbles. 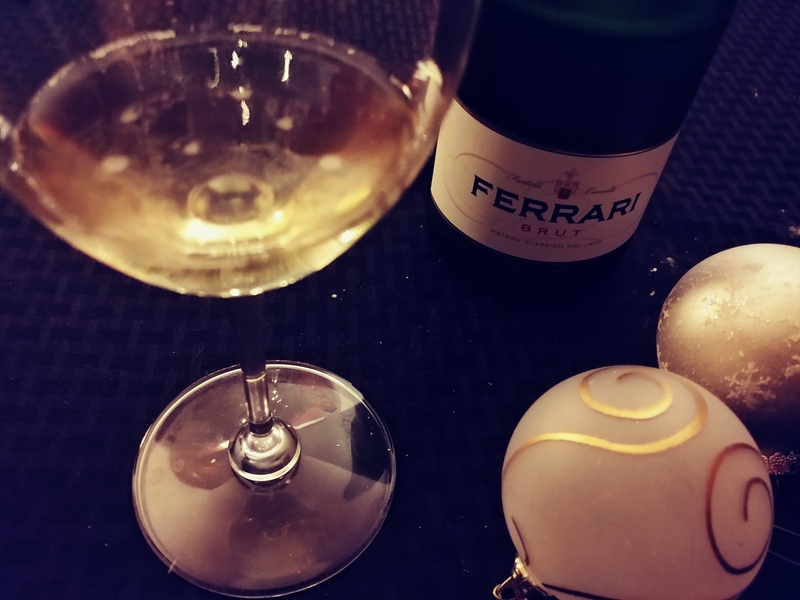 I participated in a #winestudio session last year that featured Ferrari. Great bubbles. I don’t know Contratto, but it too sounds lovely. Love the shrimp bacon pasta too!